A Call For Volunteers- Adopt A Duck!! East Valley Wildlife was founded in 1989 with a small group of volunteers who decided to make a difference in the lives of our native bird species. We rescued doves, sparrows, song birds and yes….even pigeons. Our volunteers rehabilitated the orphaned and the injured and released those ready for freedom. In the process we evolved into a large network of volunteers, spread throughout the East Valley area of Arizona. Nancy, our Founder and Director, started a special “team” of waterfowl volunteers and those kind individuals have attempted to rescue domesticated waterfowl who have been abused and abandoned on the canals of our area. Domesticated ducks do not usually survive amongst native waterfowl since they lack the necessary skills to feed themselves. These domestic ducks fall victim to both human and animal predators. We are seeking more volunteers who can raise abandoned ducklings, ducks and other waterfowl. People with “horse property” are desirable since their properties can provide the space needed. Also, there are no homeowner association restrictions that might prevent adoption of ducks or geese. So, if you know of someone who would be willing to take adopt a duck, please check out our website www.eastvalleywildlife.org to learn more about our volunteer program, education and contact us to Adopt A Duck! The recent Board Meeting of East Valley Wildlife was a success in many ways. First, we had the best attendance ever, with twelve participants, each sharing valuable ideas and information. Secondly, the meeting kicked off the inception of our Facebook page, which will be hosted by our Director Nancy. So now we are able to say…”visit us on Facebook”…for articles, photos, and stories. 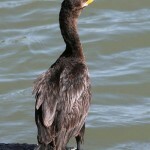 It’s A Bird…It’s A Duck…It’s A Cormorant! 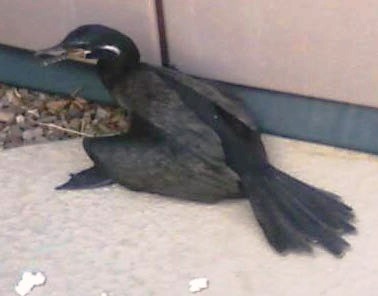 “There’s some sort of a duck in my yard and it has a broken leg.” Three calls similar to this one came in over a one week period recently and the animal in all three cases turned out to be a cormorant. A lady called about some strange duck like bird in the parking lot at Walmart in Mesa. Several hours later, a man called about this big, black bird in his yard abouta mile north of the Walmart store. And this past Sunday, Ginger Duplisse received a rescue call about a funny looking duck with broken legs in a yard in Chandler. First we have raging dust storms and now it’s raining cormorants in the East Valley. 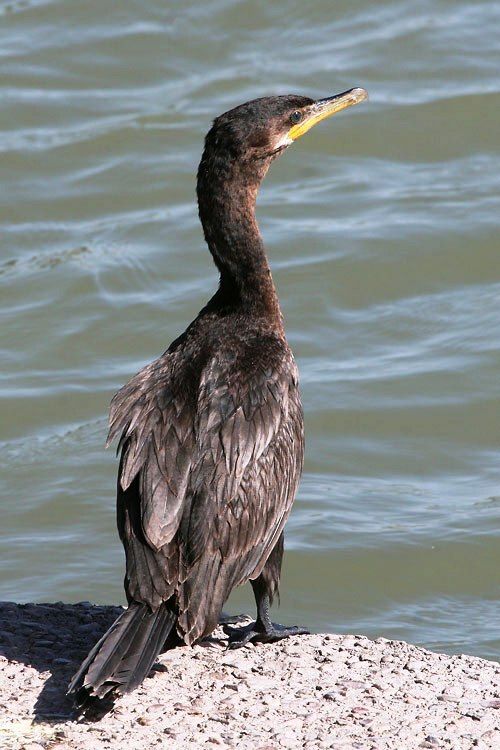 Cormorants are fish eating water birds with webbed feet and a straight bill.Their feet are set back on the body so they are awkward walkers on land,which is why so many people think they have a broken leg. More and more cormorants have made the artificial lakes in the Valley their home. Since their feathers become saturated as soon as they hit the water, they can often be seen on a dock or lakeside with wings held out to dry. Black in color, they weigh about two and a half to three and a half pounds depending on species so they are a good sized bird to find nestled in yourgeraniums. Proceed with caution! The bill has a hook at the end for grabbing fish and also lashing out at any supposed predators including rescue volunteers. Ginger was able to throw a towel over the bird and pick him up that way to get him into a carrier. In most cases, the bird isn’t injured at all. It has come down into a swimming pool or irrigation or possible was blown down by the wind and cannot get back up in the sky. These birds need a long enough lake for take off so they are stranded unless they are rescued. Left in a yard or parking lot especially during the summer, they’ll get overheated and dehydrated so it’s important to get them into water ASAP. Other water birds that need a lake runway for take off are coots, mergansers, loons, and grebes. 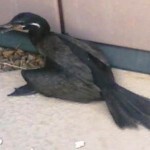 Blogger’s Note: There are two types of cormorants making Arizona their home. 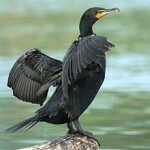 One is the Neotropic cormorant and the other is the Double-crested cormorant with orange on the face and green eyes. 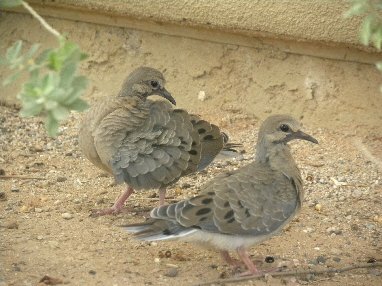 East Valley Wildlife Director, Nancy, has been busy throughout the “dog days” of summer but managed to find time to send this article about one of our prolific native species…the dove. The photo is Inca doves (one of the first species that I rescued many years ago). The Inca Dove is a smaller and more delicate version of the mourning dove (so named because of its plaintiff sound of “mourning”). Welcome to Dove Central. Most of the birds we care for have decided that it’s just too darn hot in mid July to raise babies, but members of the dove family have other ideas. About 95% of the calls we receive right now pertain to baby doves. Ma and Pa Dove are devoted parents. Both build the nest and take turns incubating their two eggs. When the kids hatch, both parents produce a substance in their throat/crop called “crop milk” which really isn’t milk but a rich liquid loaded in protein and fat. Baby doves grow rapidly and leave the nest at 11 or 12 days old. No empty nest syndrome here; if the babies won’t leave by day 13, the parents will refuse to come to the nest to feed them. They wait patiently on a nearby branch until the kids get hungry enough to flutter down to the ground. When they get to the ground , they hopefully find some protective shelter like a thick bush or ground cover. The parents continue to feed them but they don’t stay with them. A baby dove that leaves the nest at 11 days old will take about 4 days to become flighted. They’re helpless against an assortment of predators including cats, dogs, kids, ants, and grackles. They are especially vulnerable at night. The majority of calls we are receiving right now deal with fledgling doves that have been attacked by cats or dogs. Grackles are another major problem as they consider the young doves a handy food source. We also are receiving a lot of calls about “a dove that can’t fly so it must have a broken wing”. As stated, the young doves are on the ground for several days before they can fly. They should walk away from people if approached. If you can walk up to a bird and pick it up easily, then it does need to be rescued. Also consider the surroundings. A playground or shopping center is not exactly ideal; neither is a tree full of grackles or a few cats sitting on a nearby wall. Doves that are blown out of their nests during a wind storm or tree trimming can be renested. Doves are the easiest birds to renest because the parents are so devoted. A make shift nest out of a small natural fiber basket will do. Put dried leaves/grass or pine needles in the bottom. Never use a cardboard box; for some reason this spooks the parents. Plus it won’t be much use if a rain storm hits. Make sure the baby(s) is alert and feels warm in the palm of your hand. The nest doesn’t have to go in the original tree; just use a nearby tree but make sure it’s shady enough so the babies aren’t exposed to the direct sun. The babies will make a soft whistly sound when they get hungry and the parents hone in on that like a GPS signal. If the parents don’t find the nest after a few hours, then the baby should be taken to a rehabilitator. Healthy mallards that fly into backyards, office complexes, school yards, shopping centers, etc. can also fly out again. It’s illegal to capture healthy protected wildlife without a permit. It’s also fairly impossible to catch a flighted duck, healthy or otherwise. “If you don’t come out and catch these @#%&* ducks, I’m going to shoot them!” is another familiar phone call. It’s illegal to shoot migratory mallards. You would need a hunting license and you would need to be in an area where hunting is permitted. This rules out the majority of calls that we receive….about 100% of them. One irate homeowner did damage to his pool after taking a few shots at the visiting ducks. A more serious concern is that a stray bullet or pellet that could injure or kill a child or a pet in someone else’s yard. Instead of running for your rifle… discourage ducks by chasing them off, (and don’t feed them or leave pet food outside.) Once you feed them, you’ve given an invitation to stay. Wave a pool net or towel at them but be as consistent as possible. Since the mottled brown coloring of the female mallard provides excellent camouflage, people often don’t realize the duck is nesting in their yard until they wake up one morning to a dozen or so little puffballs swimming in their pool. We can get up to 20 calls a day during April, May, and June concerning ducklings in swimming pools. There are only a few people who are experts at catching both the mom and babies so the family can be transported to a suitable lake. Patience is a virtue plus there’s little choice. We’ve had calls from people who are sobbing; they’ve watched the ducklings drown over a several day period because the babies couldn’t get out of the pool. It never occurred to them to make a ramp for the ducklings. This should be a no-brainer. Making a ramp or filling the pool up to the top is your first priority; if the babies can’t get out of the pool, they will eventually drown. Use a board, screen, lawn chair or other device. It will usually take a long time for the babies to understand and use the ramp but they eventually figure it out. Unless the pool has just been shocked, the chlorine isn’t as much of a problem as the fact that there’s not a good food source for the ducklings. On a lake or pond, they’d been eating small bugs and algae. A trip to a local feed store for some game bird starter will keep the ducklings nourished or try dry dog or cat food soaked in water until spongy. Depending on the amount of calls coming in and the availability of volunteers who can rescue ducklings, it might take a few days so be prepared. Blogger’s Note: This article was written last year and appeared in our BirdTracks newsletter. But it is timeless information and deserved a repost! Nancy, the Director of East Valley Wildlife, was the ‘inventor’ of the Panic Button for our website. At least it was her idea and then the technical team took over to bring the concept to fruition. So far it has been working really well. Nancy even has the idea to ask a caller to take a photo of the rescued bird with their camera telephone (if available.) Then, through the magic of computer networking, Nancy is able to (probably) identify the type of bird. But, alas, the strategy is not fool-proof…as Nancy found out. She received a telephone call recently from a lady who was certain that she had rescued a thrasher. The bird turned out to be a grackle.